My first attempt at embedding a video in a blog post using open Live Writer. Please let me know if it doesn't work. I read Google News daily and the video is about a UFO that crash landed in America. I went for a walked around the Tring reservoirs and was rather surprised to see the water level in Startopsend was very low for this time of year and after subsequently looking at the level in the others I suspect this isn't due to low winter rainfall. The route brought me out at the far end of the watered portion of the Wendover Canal. 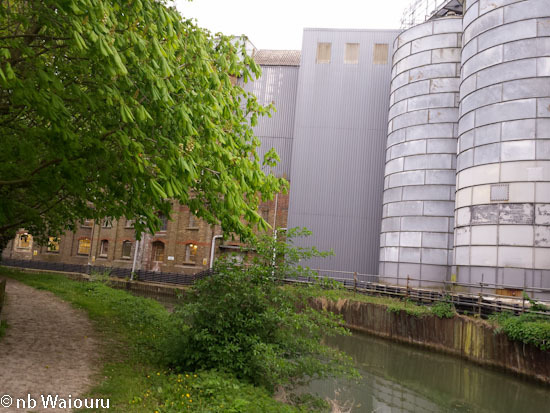 On the way back along the towpath I came upon a factory with some large silios. Despite it being after 6pm at Easter the factory was operating. The smell suggested it was a flour mill which was confirmed when I reached the other end to see vehicles with Heygates Flour on the sides. Heygates have been growing grain in Northamptonshire since 1562. They subsequently expanded into milling and now own four mills and two bakeries. They purchased this mill in 1944. 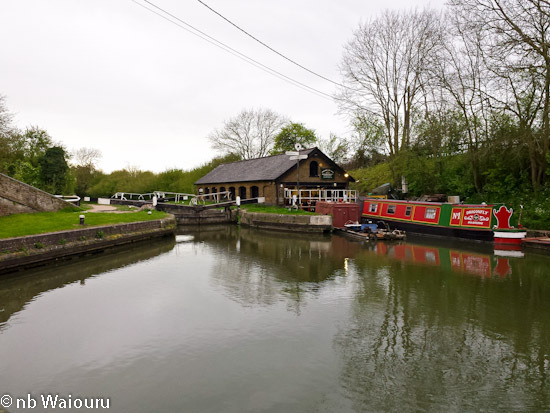 I eventually arrived at Bulbourne Junction to see Bates Dry Dock was in operation. By now it was raining and I didn't have a coat. Oh well, skin is mostly waterproof! Good job you mentioned the video. Nothing shows in the feed reader about the video so I wouldn't have even known I had missed it if you hadn't mentioned it. Al least it shows that one person actually reads your blog so I knew to look at the full version and not just the feed. Perhaps this is a really clever way of identifying your blog reader. Your video is just a blank white space viewing your post on my iPad, but I suppose if it is flash, iPad doesn't support flash so could be the reason. I usually upload my videos to YouTube using my Google sign in. Once done they are very easy then to post on Blogger using youtube's share options. Youtube videos will play on iPad. I look at the title in my RSS feed reader, because I use my feed reader only to let me know who has posted, before opening the blog anyway. Yes, it works, Tom. It appeared blank until I clicked on it, by which I mean that it wasn't displaying a sample frame until I'd viewed it. Just a white space Tom nowt else reader no. 2! Now that is a very good point Paul!! I got a message "this plug in is unsupported " so no video. Bit late reading it but then I usually am. In Firefox - once I turned on Flashplayer it worked.